Our little breakfast nook is definitely one of our favorite spots to eat and do kids activities. We couldn’t love it more. 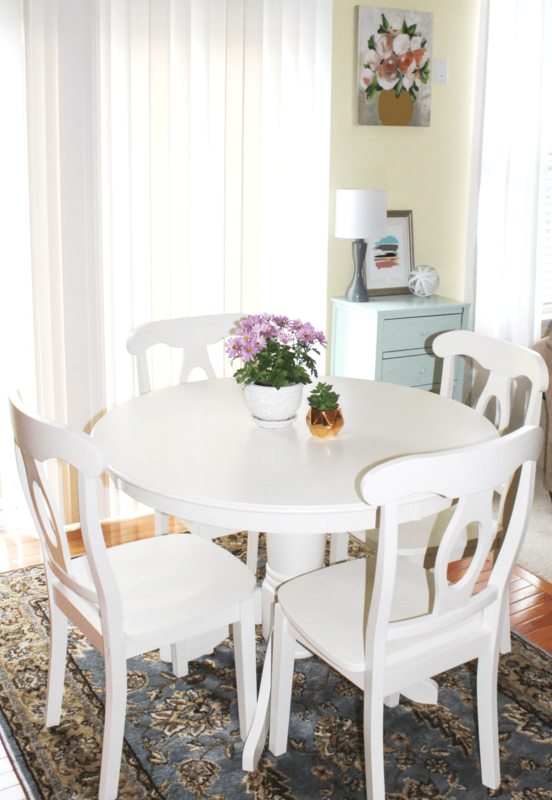 Hi guys, today I’m sharing our breakfast nook with you. It’s a post that has long been in the making but got pushed aside. I started writing it a while ago, however, other responsibilities and some other posts got in the way. Those of you busy mamas may have an idea of what it means to prioritize for the sake of everyone’s benefit. But I’ve got the post done so I’m sharing it with you. 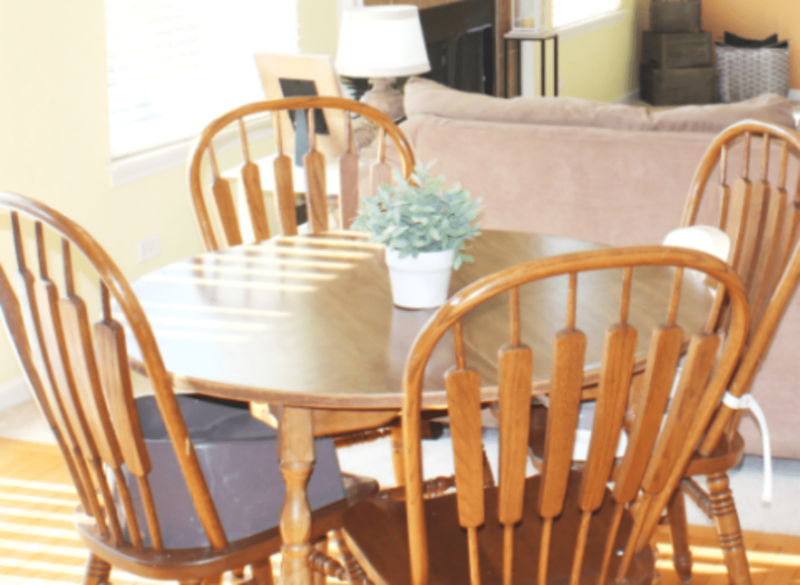 When we first moved in to this house, we used this table (photo below) as our breakfast table. It was a $10 Craigslist find for our previous home. Our kids activity table needed a replacement after many many uses. I searched for a new one (with chairs) but they all seemed so pricey and I did not want to spend a ton. Any of the ones that were turning up cheaper looked too small for growing kids, especially for our daughter who was turning 5 years old at the time. When I saw this one for almost nothing on Craigslist, I thought a makeover would spruce it up some. If all failed, it was only $10 after all!! The kids ended up not using it as much as they did the other one. For one, I think it was just a little too big for the tiny space I had it set up in and it just did not work out as I hoped. During our move, we took it with us and it ended up becoming our temporary breakfast table and dining table (the chairs around it are from another dining table we owned). The table fell apart during “the Fall” before we got a new one. I threw it out and began searching intentionally for a new one. By then, we had already got a set for the dining room but it made sense to have something smaller for everyday meals and also to fill that big empty space. In addition, it was so helpful to have the kids do activities right here in this area whenever I was prepping meals and they wanted to be closeby. Anyway, my husband thought it made sense to replace the breakfast table with another round table because we did want any thing too big and in the way. During my searching though, I wondered if I should pick any shape. Here is why. Good round table sets are not priced cheaply. My hard-working hubby wanted me to get a new one and although we considered the decision an investment. In the grand scheme of things, it was not necessarily a huge investment but it was considering this is just a breakfast table (and opposed to shopping on Craigslist). I loved the idea of a new one but when I saw how pricey they were I thought I could save a few dollars if I checked Craigslist and found one (it’s easier for me to look there as opposed to thrifting around). This time, I was not looking for any old table. It had to be in excellent condition but at a reasonable price. Well, excellent condition at a reasonable price probably was not the most reality. Ha ha.. Most of what I saw was costing as much as a new one. So I thought, hmmm, let’s go with the new one. I’ll keep searching. . . . every site possible until I find that right one. My husband did some in-store searching (IKEA and other stores) but the reality of frequent driving around to find a table was not going to happen. Online is always great! When the prices for a round set was looking too high, I began to expand my options to mix and match sets (buy the table and chairs separately). I also began to look at rectangular tables and various other shapes and designs. I even looked into plain tables with colorful chairs. Purchasing separately meant that I had to find the right style of chairs to go with the right table. To be clear, I found some fabulous options but purchasing separately was still turning out just as high or even higher in price than just getting a set. In any event, I decided to go with this set. It’s the Dorel Living Aubrey 5 Piece Pedestal Table with Napoleon style chairs. I’d seen this set early during my search but did not want to rush to get it without seeing what else was out there. I wanted to look around at various options from many places before narrowing things down. It turned out to be such a beautiful choice. The chairs are beautiful although I don’t know that they would have been my overall first pick. Looks to me like most of the affordable table and chairs are the basic Farmhouse style. Do I want an already made set or do I want to choose the pieces? 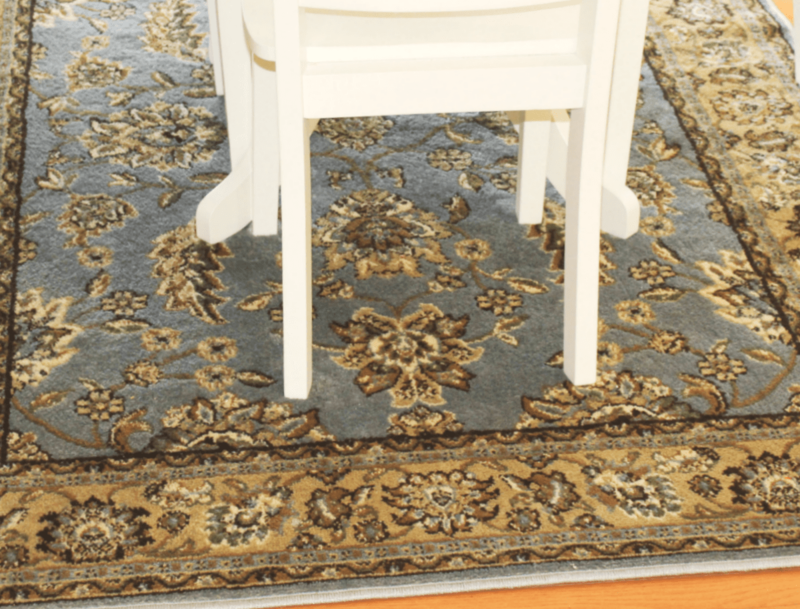 Measurements – How big is the space where the table & chairs will go? Cost – Hhow much are you willing to spend on this? Is it worth the money? If buying online, consider all the above options plus more such as: delivery options and the possibility of having to return it if it arrives cracked or broken, etc. Overall Care – Is this set easy to care for? What kind of cleaning solutions could I use? There are so many options to consider (who knew) but just make sure whatever you choose, it will work well for you and your family. Hope these tips were helpful. Overall, we are very happy with the set. We’ve had it for a few months now and it is doing great!! made from wood. We were not trying to invest in laminate plus we thought metal may have not been too kid-friendly. It’s sized at 41.8 x 41.8×30 inches and meant to fit 4 people comfortably. We simply pull up a spare chair when we are all at the table. One day we were eating dinner and one of the kids said, “Mommy, you know what I like best about eating?” I imagined she would say the food. But no. She said, “That we all sit together to eat”. I mean, that comment alone made the table totally worth the investment. The set has a beautiful stylish modern-ish finish and the white stands out and contrasts well with the brown colors in the kitchen. Apart from it being a favorite little breakfast (and dinner table), the kids use it for coloring, playdough, and some crafts. Bonus: Although it is white, it’s very easy to wipe off and does not keep food stains. Oh I almost forgot to tell you that we ended up getting this set for $150 less than the original price. When it arrived, it had just a tiny crack at one of the joint areas. We called in and they gave us 40% discount! $40% discount you all! That is way more than enough. It actually made us feel even and that we didn’t waste our money if the table were to come apart. But as you can see, it is totally perfect! 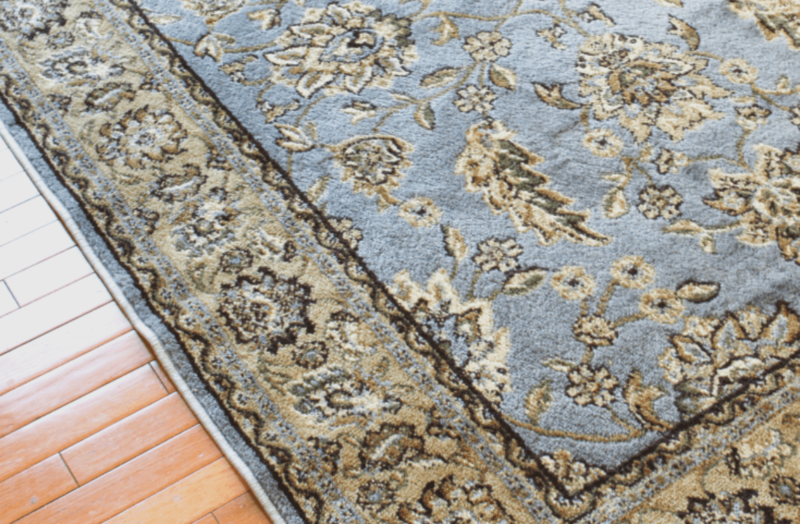 This rug, we found it from At Home stores. I think I’d noticed it during some of my trips to At Home but did not think I wanted to buy it. I love the color and so far, it’s working out very well in this little space. I also shared it on Instagram and so many liked it. There is a padding under it to keep it from sliding. It has helped much. You can see it in this post. This little desk also came from At Home stores and holds my kids art and coloring activities. The kids do activities on the breakfast table so having something close by is ideal. 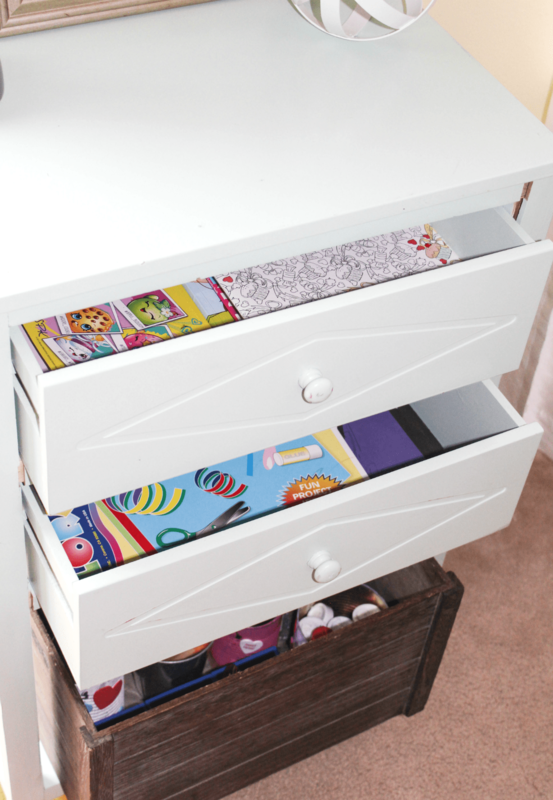 This desk keeps everything organized and tidy. You can read more about it in this post if you’d like. Looks like some of people really like the idea because it got quite a few pins. And how about that pretty canvas print? I snagged it at Home Goods for less than $20. While I was looking for a breakfast table, I was also looking for art for this corner (and for the rest of the house, too). I don’t know what it is about me finding art pieces at Home Goods. 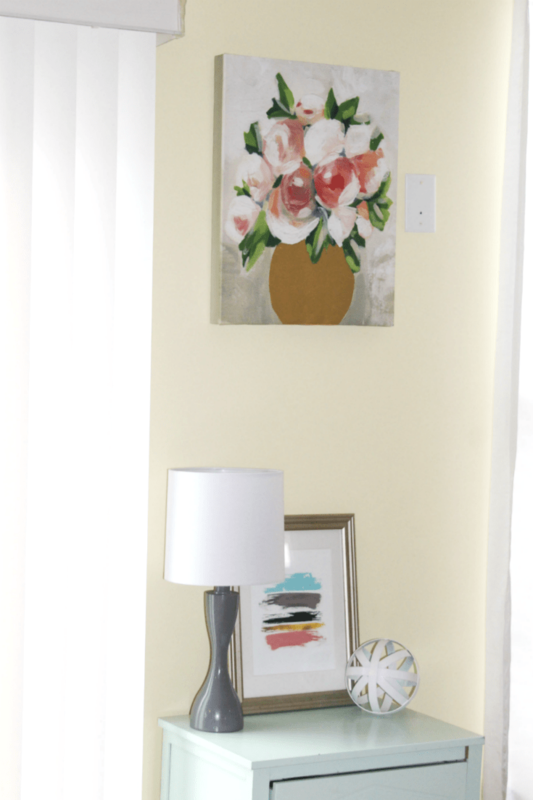 I always seem to find ONE piece on sale that really clicks every time I go into Home Goods and check the wall decor isle:) That brush paint print at the bottom is from Etsy. 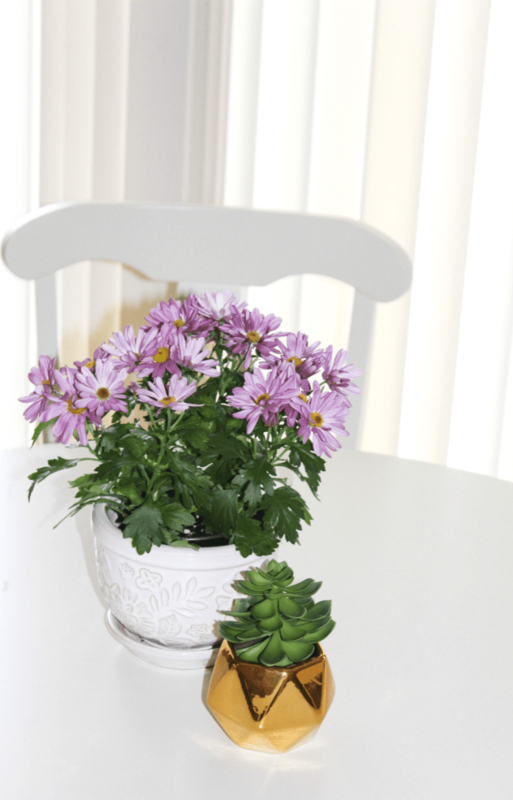 And for the table toppers, the small ceramic gold vase is from Hobby Lobby and the mums were a birthday gift from my hubby. So that’s the story of our breakfast nook. We couldn’t be more pleased with this little corner and we’re so glad we decided to invest in a breakfast table rather than some old rickety type table that may fall apart. It is very functional too in that it saves us from dragging all our breakfasts and dinners in the dining room for each meal and helps the kids to have a wider space to do their activities. 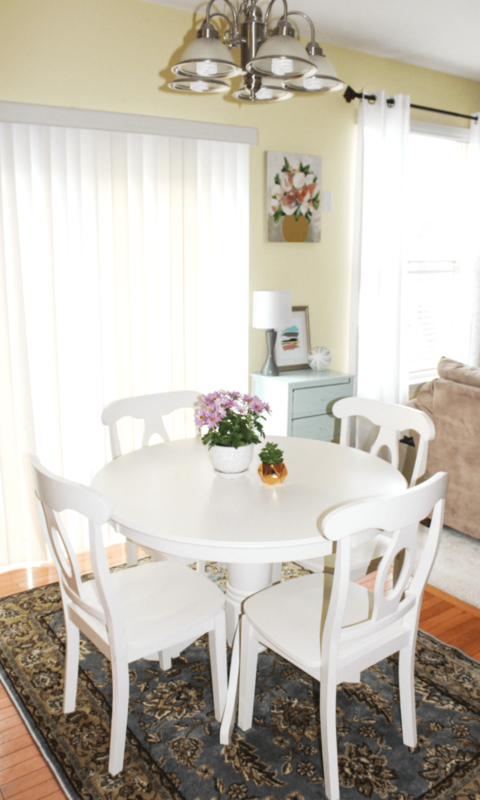 I was working on the overall kitchen spruce up to show you how everything flows together with the breakfast nook but one thing at a time for sure. What do you think of this set? What else would you consider when searching for a breakfast or even a dining table with chairs? I’d love to know your thoughts. Affiliate links were used in this post. I will make a few pennies if you make a purchase through any of these links with no additional charge to you. I love white furniture so I adore this set. I love how you keep fresh flowers on the table too. Thanks Helen. And fresh flowers are “everything” aren’t they?!!! Love them too!! Wow! You sure put a lot of thought into your table & chair set. My husband and I go shopping and pick something in 15 minutes! (And maybe that’s a little too quick.) Anyway, you scored on the %40 discount. Good deal! Haha… 15 minutes?!! Well, I guess after having a second hand one that fell apart, I wanted to get the best for the money. Thanks Alexandra!! Love how it turned out! I love any white furniture! The white really stands out. And it is very easy to wipe down, too!! I love the table and the chairs! We have a nice wooden table, but the chairs are falling apart and chairs are so expensive! My dad is going to be building us a farmhouse table, but I’m going to have to find some chairs to go with it. I better start searching now! How nice that you can build a table? I don’t have such resources and help – but the prices of the chairs could really add up. Hope you get some you will love!! A 40% savings makes everything better! 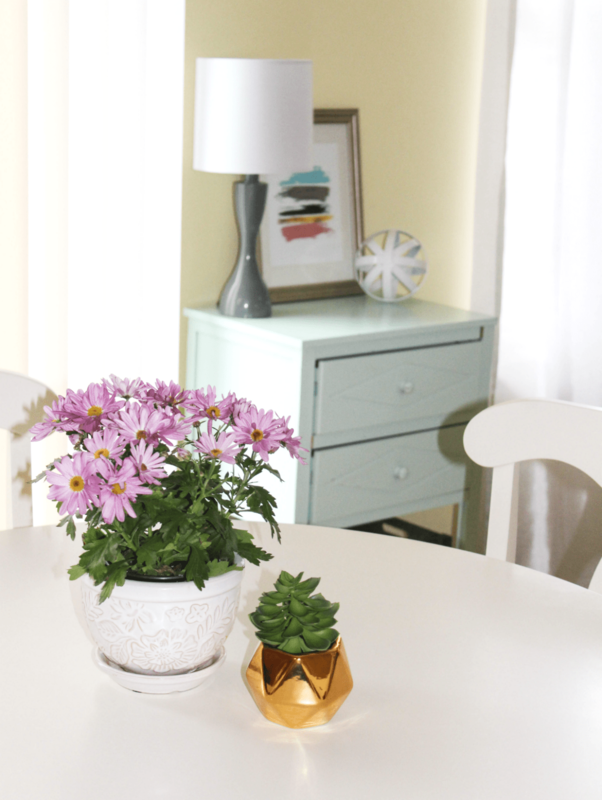 I love your breakfast nook and the fresh flowers add a beautiful pop of color. Sometimes I get overwhelmed when looking for furniture. There are so many options and I don’t want to make a costly mistake. You did a great job and I love the table and chairs. thank you Alli for your lovely comment!! Furniture searching is really overwhelming – a reason it took us so long to find something that would work well. Getting back 40% on this one (after the fact) was an additional blessing. It takes me forever to make decisions about furniture and decor. 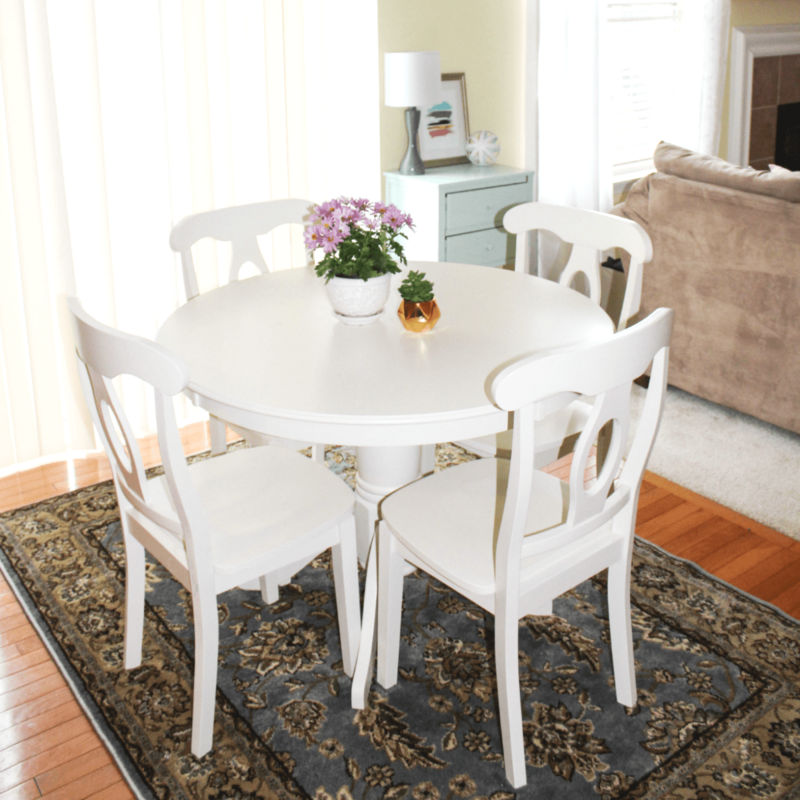 We always want to include function in the plans while not sacrificing looks and your table is so pretty in white and looks great in your space. I like a round table in the kitchen too. Somehow it seems to keep everyone close together for meal conversations. We tend to enjoy eating at our breakfast table more than in the dining room and I think it’s because of the the closeness. Your Mums are so nice as a centerpiece. Happy belated birthday. I have to agree with what you said about conversations and closeness around the table. I love how you phrased them!! Our dining room is nice to eat in but sometimes, you just don’t want to deal with all the set up and take down. Thank you so much Shirley – the mums are definitely pretty. I understand what a large task it is to shoose the right table. Bravo to you for waiting it out. Your choice is perfect for your space. Its so bright and cheery too.